I remember the shoe store my mother used to take my brother and me to when we were little. I remember men handling my ticklish feet and squeezing them with cold metal implements. I remember being asked, over and over, “Do those feel okay? This is really important. Don’t step off the carpet!” No, they hurt like hell. All of them. Every time. But I quickly got the message that the right answer was to say they feel okay. I remember how, every day, the best part of the day was taking my shoes off at night. 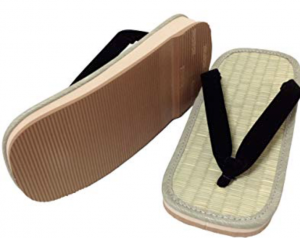 When I got to high school, I stopped wearing shoes in favor of tatami sandals. I took years of ridicule. When I did have to wear shoes, they hurt every bit as much as ever. Parents and friends would say “because you go barefoot all the time, wearing shoes hurts your feet.” No, I wanted to scream, I go barefoot because wearing shoes hurts my feet! I should also mention that walking is one of my great passions. I walk a lot, though at times of great foot pain I find myself biking more. So I went through life wearing an odd collection of flip flops and river sandals or nothing at all on my feet. I was a Southern California surfer and it was mostly accepted. Mostly. I built a successful consulting business in IT. While many people objected to my footwear, overall it probably just added to the eccentric child prodigy persona I had acquired. I started medical school in my mid-30’s (after several painful interviews conducted in a beautiful but exquisitely sadistic pair of Swiss Ballys). One day I got to class and realized that, for the first time, we were going to the hospital instead of to lectures. The hospital is no place for sandal-clad feet (think falling scalpels and dropped hypodermic needles). I actually had to go to the college bookstore and buy some socks and ill-fitting sneakers. The last two years of medical school and the first few years of residency were podiatric hell. It was usual for us to be on our feet for 12+ hours a day, and 30+ hour shifts were not rare. Everybody had sore feet. I felt wimpier than most, but didn’t think that I was really an worse off than my fellow housestaff. It got to the point where I was limping everywhere, and I asked one of the attending docs to check it out. I got a nuclear medicine scan of my feet which showed numerous stress fractures. I went to a podiatrist in the orthopedics department, and she made casts of my feet and created some custom orthotic insoles. My insurance didn’t cover them, though, and in one of the kindest moves I remember from residency, she “lost” the billing paperwork (around $600, IIRC). It was only then, in my late 30’s, that I realized that most people don’t walk around most of the time with screaming foot pain. The orthotics eventually wore out or got lost and, as a newly minted doc with a newly minted son, I didn’t have the time or money to see a podiatrist. I went into the new Good Feet Store near my house and, while I was shocked at the prices, I managed to come out with some decently professional-looking shoes (didn’t win any fashion awards) with arch support insoles that seemed to work as well as the custom jobs. Recently, insidiously, my feet have started to hurt again. I did a real number on them standing on a ladder and wrestling with an 80 pound whole house fan over my head. I tried various remedies and combinations of my weird shoes and old insoles, but things just kept getting worse. 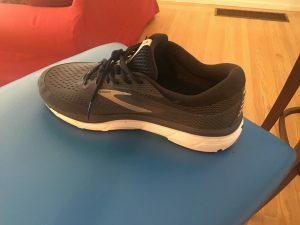 I visited the Good Feet Store again yesterday, and came out with a pricey ensemble of general-purpose sneaks with arch-support insoles (nearly $600, but these days I can afford it). After only a few hours of wearing them, it seems that my feet are in considerably less pain.